Writers have countless ways to spend their money — whether on a double espresso to push through a final draft or a conference that has called to us for years. We all have life expenses that we must spend our money on now, as well as more wishful things that require time and sacrifice to save up for. Here are a few free and useful resources to help you save money while still being able to organize, edit, and shape your writing world and its characters. yWriter5 is free novel-writing Spacejock software (designed for Windows PCs) that helps a writer organize and keep track of scenes and chapters, characters, settings and plot elements. “It will not write your novel for you, suggest plot ideas, or perform creative tasks of any kind. It does help you keep track of your work, leaving your mind free to create.” The program was designed by Simon Haynes, programmer and author, after he struggled to keep track of the elements in his own first novel. You can type directly into yWriter5 or use your own word processor and then use yWriter5 to keep track of scenes, etc. Features include: tracking your progress; automatic backups at user-specified intervals; adding multiple/viewpoint characters, goals, conflict and outcome fields for each scene; a storyboard view for a visual layout of your work; re-ordering of scenes, drag and drop elements. “Contains no adverts, unwanted web toolbars, desktop search programs or other cruft.” K.M. Weiland has a yWriter video tutorial on her website here. ProWritingAid is a free online writing editor. Paste in a chapter and it produces 19 free reports to improve your writing – checks grammar and spelling; finds overused/repeated words and phrases, and clichés; checks for consistency in spelling, hyphenation and capitalization; analyses your manuscript for alliteration, vague/abstract/complex words, passive voice and adverbs, sentence length, and dialogue tags. One of the things I enjoy most about ProWritingAid is the feature that creates a word cloud – a visual representation of the most often used words in your text. For an example, see the word cloud for this article at the top of the post. Listening to your work read aloud is a good way to catch mistakes and missing words, and also hear how it all flows. NaturalReader is free text-to-speech software with natural sounding voices. This software can read any text from Microsoft Word files, webpages, and PDF files (and can also convert text into audio files such as MP3 or WAV). 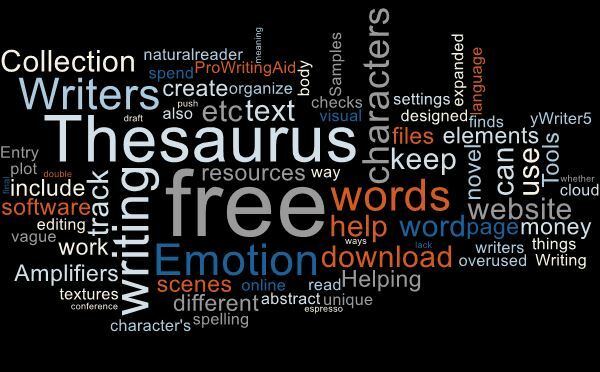 There are plenty of online thesauruses that provide alternate word choices, but nothing as extensive as what I found on the Writers Helping Writers website with its collection of free resources. If you “need help describing your character’s pain, exhaustion, illness, dehydration, hunger, stress, attraction and more” download Emotion Amplifiers (a companion to The Emotion Thesaurus by Angela Ackerman & Becca Puglisi). This is a free 33-page pdf that “supplies the body language, thoughts and internal sensations that accompany conditions that ‘amplify’ a character’s mental state, leading to a stronger emotional reaction.” Go to the Writing Tools page (with lots of other free stuff) or click here for a direct link to the Emotion Amplifiers download. The Talents and Skills Thesaurus Collection – skills or talents make characters authentic, unique and interesting. What are your favorite free writing and editing resources? This entry was posted in Writing Resources and tagged writing resources by Cate Macabe. Bookmark the permalink. Thanks for sharing these tools! I need to give some of them a shot! You’re welcome! If you have favorite tools to share, let me know. I’ll be posting an update in the future. Some great writing resources listed here. Thanks for the reblog! I’m glad you like the article. I loved yWriter back when I was using a PC. I am now using Scrivener, but you can’t beat the price on yWriter. I’m also a huge fan of K.M. Weiland’s site. I picked up a copy of Scrivener at half price as a perk of “winning” NaNoWriMo, and now I’m learning to apply all the nifty tools. Thanks for dropping by! Thanks for linking to my yWriter tutorial! Glad you enjoyed it. yWriter is a great program. You’re welcome. And thank you for maintaining a great website with so much useful writing advice.